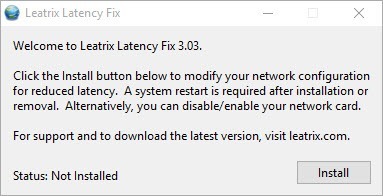 Leatrix Latency Fix is known for reducing the online game latency and complete achievements and tasks which require a reliable Internet connection. Latency can cause a lot of issues when you are playing online and can quickly ruin your experience as a gamer. High latency can be a game killer, and you should fix this issue as soon as possible. 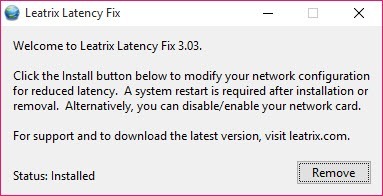 Leatrix Latency Fix is a handy and easy to use software which has been designed to reduce the latency you are experiencing when playing online games. It has a quick setup, and you have to run it using Administrator rights. 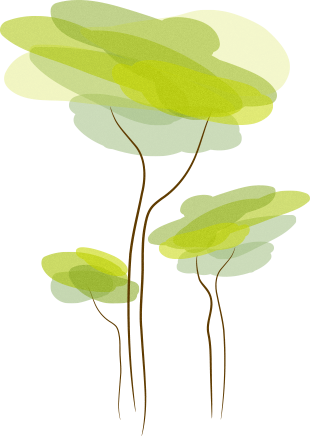 The installation procedure is pretty simple and straightforward. You have to run the executable file and reboot your PC, and after that, the app should display the installed status and you can quickly login your favorite game and check the difference. This utility reduces latency by increasing the frequency of TCP acknowledgments. It eliminates the delay before new data is received in hence. It changes the network priority of your system and forces it to trade efficiency for better latency. If you usually log in different online gaming environments, then you may find this tool pretty useful. In some cases, high latency can be due to improperly maintained game servers, but usually, the culprit is a standard Internet connection.